The Cody Law Firm is a full service, regional law firm with a world–wide military justice practice and a reputation for providing the highest quality, result-driven legal services to corporate and individual clients. The Cody Law Firm serves businesses and individuals throughout New Jersey in virtually all major legal disciplines, represents criminal defendants in New Jersey and defends U.S. military members throughout the globe. The firm's principal office is located in Hammonton, New Jersey, a town located roughly halfway between Philadelphia, Pennsylvania and Atlantic City, New Jersey. Additionally, our attorneys will travel where needed to defend U.S. service members in actions brought under the Uniform Code of Military Justice. 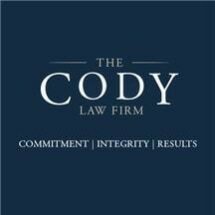 We invite you to browse our website to obtain more information about The Cody Law Firm and its attorneys, and how we might be of service to you. We also welcome your comments and inquiries. In 1996, Kerri E. Cody, Esq., a native to Hammonton, New Jersey opened the doors of her private law practice with a focus in the areas of personal injury, civil litigation, commercial transactions and real estate. In 1997, Kerri was married to Douglas L. Cody, Esq., who was then a Captain in the U.S. Marine Corps attending Rutgers School of Law in Camden, New Jersey through the Marine Corps Funded Law Education Program. Upon his graduation with honors from the Rutgers School of Law in May of 1998, Douglas Cody began his first tour of duty as a Marine Corps Judge Advocate. Kerri Cody remained in Hammonton, New Jersey building the law practice and setting the foundation upon which the firm would be built. After graduation with honors from Naval Justice School in military justice and administrative law in Newport, Rhode Island, Douglas Cody was assigned to Marine Corps Base, Quantico, Virginia where he served as a Federal prosecutor and trial defense counsel in all types of major felony criminal cases. Fundamental to the demonstrated success and extraordinary results achieved by The Cody Law Firm is the firm's dedication to aggressively serving its clients while scrupulously honoring the rule of law. The firm's philosophy is rooted in integrity, devotion to the client and putting in the hard work that superior legal services demand.